How often have you heard someone say, “I don't really like music”? Most people enjoy music, whether they’re classical-concerto buffs or indie-rock megafans. And there’s good reason for that—studies have proven that music can make you happy. A veritable smorgasbord of apps out there can help you listen to tunes, discover new artists, or even make your own jams on the fly. And don’t forget about live music: Tracking concerts via weekly newsletters and multiple websites can be a chore, and you’re bound to miss out on some good shows. If you’re a die-hard fan, you’ll want to download an app to track your favorite bands and venues. Here are seven that can keep you in the loop on live music. This online concert-listing service offers free apps for Android, iOS, and Windows Phone, all of which draw from the extensive database at preAmped.com, a site that covers venues big and small across the United States. The app uses your device’s GPS function to populate upcoming shows in your vicinity; you also have the option to look in other areas you may be traveling to in the near future. You can search for specific artists and save them as favorites to get notifications on when they will play in your area, and the app can search your music library and recommend concerts based on your songs. Other features include directions to venues, photos of recent events, and links to purchase tickets from the original vendors (such as Ticketmaster). You can also get updates on new album releases, receive email reminders about the show, or track a particular artist's tour. Bandsintown is a beautiful app that is designed not only to keep you informed when your favorite bands come to your area, but also to help you discover new artists that you might enjoy. You can sync your Google Play, iTunes, Last.fm, Pandora, and Spotify accounts to receive automatic recommendations, and if you connect the app with Facebook, it will draw from your music activity there as well. The app lets you RSVP to shows, purchase tickets at vendor sites, and share via Facebook and Twitter to encourage friends to join you. The concert cloud feature provides a unique way to browse shows by emphasizing which of your most-listened-to bands are coming to town soon. Or you can view upcoming performances by Recommended, All Local Events, Favorite Artists, or RSVPs. 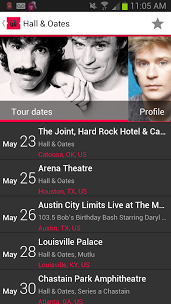 onTour for Android is an on-target app for those who have a list of their favorite artists and venues; its recommendations are heavily dependent on your personal preferences. 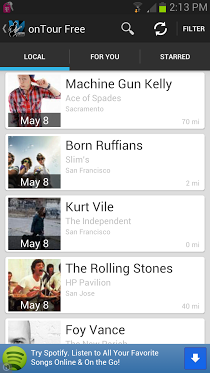 When you fire up the app, it prompts you to enter bands and venues. Alternatively, you can connect to Last.fm to import artists from the service. That done, you see three options for browsing: Local, which populates any shows in the area based on your GPS location; Artists, which lists your favorites as well as recommendations based on your musical tastes; and Venues, which shows upcoming concerts at your favorite spots. Once you dive down into individual concerts, you can mark favorites, save concerts to your calendar, share over social networking (Facebook, Twitter, email), and map the location. Faithful Spotify users will appreciate Songkick Concerts, which, in addition to offering apps for Android and iOS, also provides a useful Spotify plug-in that provides a personalized concert calendar based on your playlists. The mobile app also shows a local concert calendar for your favorite artists, and it automatically scans your music library, Last.fm app, and Google Music account to give recommendations in the area. You can import favorites from Facebook and Pandora, as well as manually enter artists. Other features include push notifications for upcoming concerts, information on the event (such as the lineup and venue map), and ticket purchasing. Thrillcall is an app for Android and iOS that’s perfect for procrastinators and deal-seekers alike. This service aims to inspire spontaneity by providing exclusive deals on last-minute concert tickets. It also provides sample songs from artists, as well as links to purchase the songs (iTunes/iOS only), information on the venue (including the address, the phone number, and the location pinpointed on a map), and the ability to buy tickets from within the app. 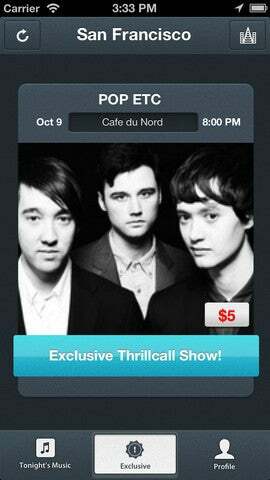 To bring you these deals, Thrillcall partners with promoters like Noise Pop and venues such as Great American Music Hall. The downside? It’s currently available only for Chicago, Los Angeles, New York, and San Francisco (with Seattle on deck). Gigbeat is a great option for Rdio users, as it’s the only app that integrates with that service to populate your favorite-artists list. It can also scan your music library, Last.fm account, and Songkick. And those who like to show off which concerts they’ve attended will dig the built in Foursquare functionality, which handily keeps track of all past shows for future reminiscing. 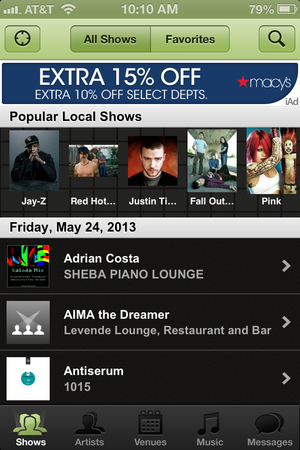 Like the other apps, Gigbeat will scan your location to show nearby events and concerts. You can track multiple cities and venues, receive notifications for upcoming shows and added tour dates, and purchase tickets via Songkick. The app also offers a home-screen widget that will help you keep on top of your upcoming shows. On the whole, BandFunk is a pretty standard concert-finding app. It lets you track your favorite artists, read their biographies, and get notifications when they’re performing nearby. 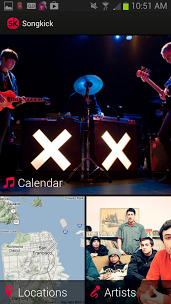 The app also provides news about artists plus recommendations for other shows based on your musical tastes, and you can share concerts via text, email, or social networks as well as add them to your calendar. 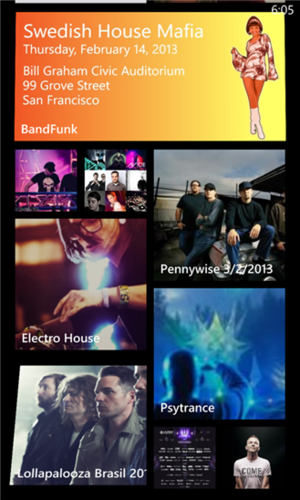 The Windows Phone version is particularly interesting, as it lets you pin artists, concerts, and genres to the start screen, and artist tiles automatically update when they have a tour near you. In the free version, you can follow up to ten artists (the upgrade is $2). Unfortunately, this app doesn’t scan your music library (or any service) to populate your band preferences automatically.